Dr. Emily Pineda founded South Texas Arthritis Care Center in San Antonio, TX where she practices Rheumatology. Dr. Pineda has been performing ultrasound guided injections since 2006. Dr. Pineda is the first in South Texas to provide cutting edge therapies such as Ultrasound-guided Platelet Rich Plasma Therapy for various joint and soft tissue ailments, Ultrasound-guided Stem Cell injection Therapy and Fat Graft Injection for Osteoarthritis of the knee. Dr. Pineda graduated from the University of Santo Tomas, Philippines. She completed her Internal Medicine residency in Sound Shore Medical Center, New Rochelle, New York. She completed her Rheumatology Fellowship at the prestigious Brown University Program, Providence, Rhode Island. She started private practice in Michigan in 1998. In 2005, she and her family moved from Michigan to San Antonio, which she now calls home. Dr. Pineda is a Board-certified Rheumatologist. 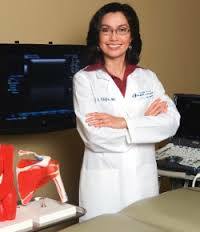 She is a member of the American College of Rheumatology, American Institute of Ultrasound in Medicine, American College of Physicians, Texas Medical Association, Bexar County Medical Society.